Being able to move efficiently is important in avoiding injuries. Having joints capable of providing sufficient movement and muscles capable of producing sufficient force is vital to generate an efficient gait cycle. If joints are stiff (usually caused by muscle tightness), limiting the range of motion, or muscles are weak, the body must find ways of compensating for the problem, leading to biomechanical abnormalities. Gait analysis is usually performed by a professional, such as a podiatrist or physiotherapist, although it is now becoming more widespread and readily available with many specialists running and sports shops now gaining the equipment and staff who are trained in gait analysis. 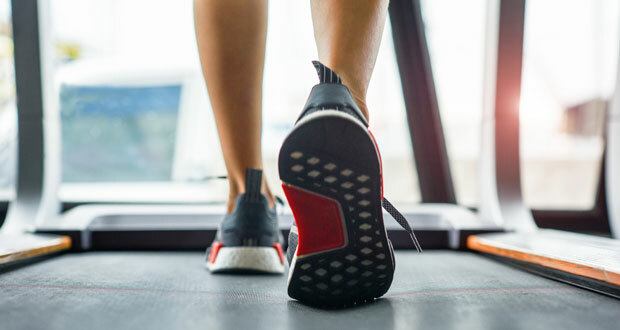 Gait analysis usually involves walking or running on a treadmill. In some cases the professional will simply watch the way that you move, looking in particular at your feet, ankles, knees, and hips. In more specialist settings, a video recorder will often be set-up behind the treadmill, which will record film of your gait cycle. This can then be relayed to a laptop where slow motion and freeze frames can be used to carefully assess your running or walking style. This form of gait analysis usually focuses on the feet and ankles. Watch our video on treadmill gait analysis here. One way that you can get an idea for yourself whether you pronate, supinate or have a neutral foot strike is to look at the wear of your trainers or shoes. These must be shoes which you have worn a lot so that there is a pattern of wear on the sole. Watch our video on assessing trainer wear here. Sports podiatrist Ian Sadler explains gait analysis using a foot scanner and treadmill analysis. The gait cycle is the continuous repetitive pattern of walking or running. The gait cycle is split into two main phases, stance, and swing, with one complete gait cycle including both a stance and swing phase. When running, a higher proportion of the cycle is the swing phase as the foot is in contact with the ground for a shorter period. Because of this, there is now no double stance phase, and instead, there is a point where neither feet are in contact with the ground. This is called the flight phase. As running speed increases, the stance phase becomes shorter and shorter. If it is found that there is an abnormality of your gait cycle. This can usually be correct with a change in footwear, the use of orthotics or an exercise programme. Running shoes usually cater to those who either overpronate, oversupinate or have a neutral position. It is important to make sure you have the right running shoes for your style of running.